Hendon is a London suburb in the Borough of Barnet and is famous as the home of Hendon Football Club, aka ‘The Greens’ as well as the Royal Air Force museum which is situated on the historic site of Hendon’s Aerodrome. Make your friends and family green with envy when you sell your car at WeWantAnyCar.com’s Hendon pod and fly away with a great deal on your unwanted car. Want to sell your second hand car in Hendon, but not sure where to get the best deal? WeWantAnyCar.com is here to help at its conveniently located pod in the Sainsbury’s car park on Hyde Estate Road where you are guaranteed a quick and simple sale. Visit the pod and you will receive a free, no obligation valuation, comprehensive consultation and a fast payment service. The perfect one-stop-shop for selling your unwanted car, the pod provides a professional car buying service with expert friendly staff on hand to help every step of the way. Just off the A5 and a short drive from Hendon railway station, WeWantAnyCar.com’s branch is open Monday to Friday 9.30am to 6.30pm, Saturday 10.00am to 6.30pm and Sunday 10.00am to 5.30pm. WeWantAnyCar.com’s professional service takes the hassle out of selling your car to ensure you get a stress-free experience. Get started by inputting your car details into the free online valuation tool, you will then receive an instant honest, no-obligations quote. Like what you see? Book an appointment online and arrange a time to swing by our Hendon branch and remember to bring all your documentation with you. Our experts will look over your car, complete all the necessary paperwork and finalise the deal. With same day sales there really isn’t any reason to go anywhere else! Not only that, we promise to match any other valuation you have received*. Don’t forget, we want any car regardless of age or condition - to get in touch contact our friendly sales manager on email hendon@wewantanycar.com or why not just drop by for a consultation. Excellent customer service, really helpful and explained everything down to a tee. Would thoroughly reccomend this service over We buy any car, our representative Amish was great. 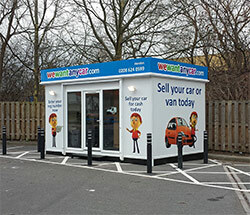 I recently sold my car with We Want Any Car.com at the Hendon (North West London) branch. Here I met Amish who handled my appointment in a polite and professional manner. Amish was clearly extremely busy with back-to-back appointments yet he made time to clearly explain the process to me and was extremely transparent with any deductions made from my valuation. I walked away with what I consider to be a fair price for my vehicle. Would happily use We Want Any Car.com again. Many thanks Amish! Would not hesitate to recommend We Want Any Car as a way of selling your car. The branch in Hendon is excellent, with exceptionally friendly and informative staff. 5 stars. I seldom write review but I would like to write this time as the advisor Sunny is very friendly, helpful and professional. Not pushy at all but respect your decision and opinion. The whole process has been done in 25 minutes, payment received at the next 2 and half hours. Price very reasonable. Initially, the negative feedbacks from the website have been pushed me down; almost no confident to sell the car with Wewantanycar. To be honest, they are not like what the negatives have said. You really need to know your accurate fault before accusing others. They are really reasonable. Please note, I am very fussy person. Try them if you are a sensible person! Good valuation - better than the competitors. Superb customer service from Gerard he even offered me a lift home as I was the last appointment! Had a great experience at we want any car. I had the pleasure of meeting Amish Shukla, who has amazing customer service and was very helpful. I would definitely recommend this company to anyone! Thank you very much Amish! Ozzy who dealt with me was fantastic, as promised money in my bank within 10 minutes, great service 10 out of 10 for Ozzy.